Hello! As of today, it is officially Autumn, which means that there are only three full seasons left until Summer. How awesome, (or depressing?) is that!? Things are going well in my classes for most students. I feel like routines are being established and students are understanding, (and meeting) expectations. My goal this year is to push people a little harder to meet their potential. In some cases, this means conferencing with students. In other cases, it means having students redo their work to ensure that all success criteria is met. NAC2O – Grade 10 Native Studies students have done some work around identity and leadership. A number of assignments have been completed including some reflective writing and historical research projects. We will be moving to talk about history this week and next, as well as things that link all First Nations, Métis, and Inuit people together. 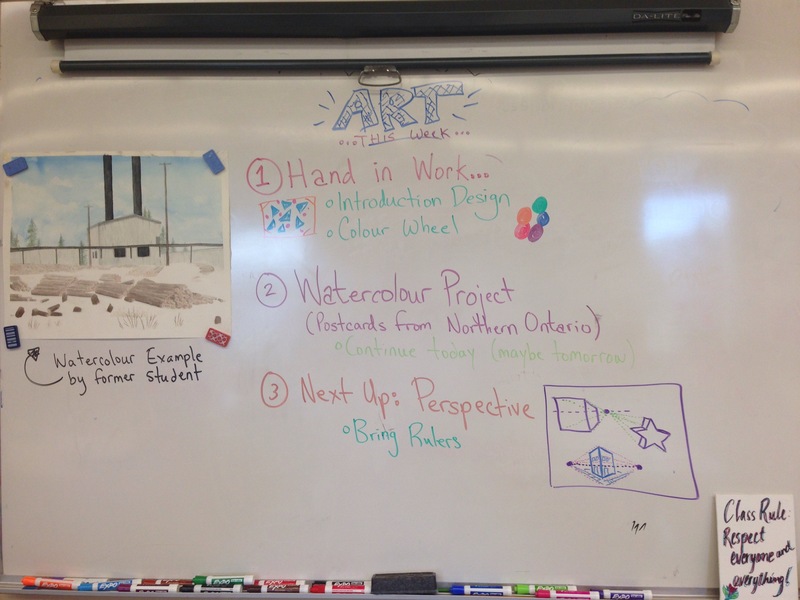 In ALV1O – Grade 9 Art, we spent some time getting acquainted with watercolours. Students creates postcards with northern Ontario images. Many students showed knowledge of techniques like washes, brush movements, and colour mixing. I will share some of the work soon. We will begin an examination of Perspective today, which will remain the focus for a little while. It’s important to ensure that students are keeping up-to-date with assignments. Remember, appointments to work during the Activity Period can be made. As always, please let me know if there are any questions, issues, or comments that I should know to help students find success.